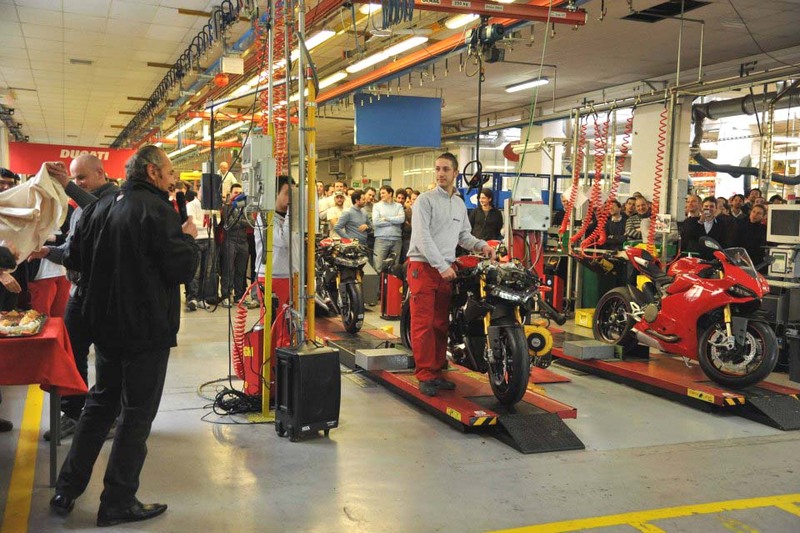 The first Ducati 1199 Panigale rolled off the assembly line at Ducati’s Borgo Panigale factory today, officially starting production of the Italian company’s flagship model. While maybe the the production of the first Panigale is not the most newsworthy of subjects, make no mistake at how important this motorcycle is for both Ducati and sport bikes in general going into the future. Featuring a new step in production motorcycle chassis design, we’ve also already talked at length about the number of firsts that the 1199 Panigale is bringing to the production motorcycle market. With a hybrid chain/gear-driven camshaft, titanium valves, a wet slipper clutch, a ride-by-wire throttle, rider-selectable “riding mode” system, and 15,000 mile major service intervals, the Superquadro v-twin motor alone is a major step for Ducati with its Superbike engine design. And, if you add in the first full-LED headlight on a produciton motorcycle, the first electronically-adjustable suspension on a sport bike, the first motorcycle engine braking control system, as well as the first GPS-assisted data acquisition system for a production motorcycle, the total package of the 1199 redefines the word “superbike” and takes the next logical technological step forward in this market segment. However features aside, what will truly be the most important aspect of the Ducati 1199 Panigale is whether or not the flagship model can live up to the hype that has been generated around the machine. While most of the attention to-date regarding the Panigale has centered on whether Ducati’s monocoque chassis design can work on the production motorcycle, after it has failed so miserably in MotoGP, the real issue for the Italian brand has nothing at all to do with the 1199’s race track prowess. Taking a step back on our analysis regarding the business case for the Ducati Diavel, what is really the most important aspect about the Ducati 1199 Panigale is that the company’s newest sport bike has to be knocked-out-of-park home run win for the Italian brand if it wants to do right by its loyal cult following. The Ducatisti of the world have endured the addition of bikes like the Hypermotard, Multistrada 1200, and Diavel into their “sport bike company’s” model line-up, fighting each models addition to the brand’s scheme with an audible fervor. I won’t reiterate in too much detail how Ducati has been transforming itself from a sport-bike-oriented company into a performance-oriented company. Though, I will say that a large portion of that transformation has centered around the idea that by keeping its roots in the sport bike market strong and true to the old brand values, the Ducati can presumably get away with its brand being “diluted” (other critics’ words, not mine) by the addition of new genres to its motorcycle rostrum. While the push-back against the Hypermotard, Multistrada 1200, and Diavel has largely amounted to pundits in search of headlines running around and yelling that the sky is falling, the stir that could be made if the Ducati 1199 Panigale fails to live up to the expectations of what the Ducatisti deem to be a true Italian superbike is very real. A failure to engage the Ducatisti establishment with the Panigale would signal serious trouble for Ducati, its brand, and the company’s work over the past five years. Now that the first Ducati 1199 Panigale has rolled out of the door in Bologna, the die is cast, the chips are in play, and our course is set to see if Ducati has created a “massive breach of brand trust and honesty.” The realization of course should be that Ducati’s brand was never in danger with bikes like the Hypermotard, Multistrada 1200, or Diavel. Instead, the danger of serious brand dilution has always rested on how Ducati handled its Superbike line. A failure to produce a two-wheeled machine that is both as striking visually as it is kinetically, could permanently alienate a loyal fan base that has endured a great deal in the past half-decade. 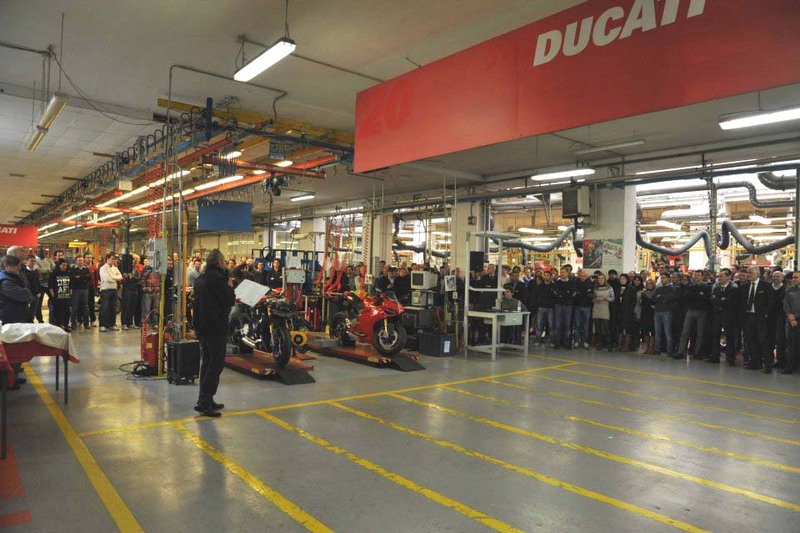 Ducati has built itself into a company that can make virtually any machine it wishes, so long that those products meet a very basic set of criteria, and provided that the company’s center, the Superbike line, remains unwaveringly loyal to the central ethos that has been the Ducati brand for the past 30+ years. How will Borgo Panigale fare? Only time will tell, but we won’t have to wait long for an answer.